Adult dogs of small races (less than 10 kg adult weight), since the end of growth (10 months) up to middle age (8 years). Ready to serve. Respect the recommended daily ration. Always leave fresh water available to the dog. It covers the high energy needs (4.132 Kcal/Kg) avoiding overweight with L-carnitine, which stimulates the mobilization of the reserves of fat. It nourishes the hair and protects the skin due to the amino acids azufrados (methionine and cystine) for the formation of hair, fatty acids (Omega 3 and Omega 6) for the brightness of the fur, zinc, folic acid, vitamins A and B for the health of the skin. It satisfies your appetite due to the size, shape and texture adapted croquettes, nutritious substances and rigorously selected natural flavourings. Dehydrated poultry, corn, yeast, gluten, egg: very high quality protein sources. Beet pulp to promote digestive safety. Oil fish as a source of Omega 3 fatty acids, EPA-DHA with an anti-inflammatory action on the intestine, and oil plant as a source of fatty acids, Omega-6 to take care of the skin and fur. 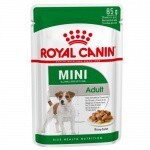 Small breeds dogs are very long-lived, they now need a particular food. 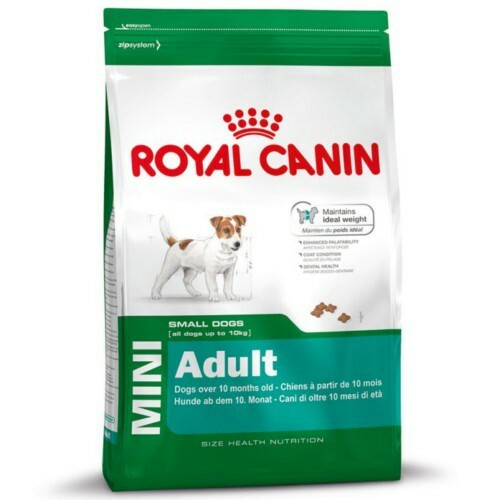 Mini Adult, very palatable croquettes which guarantees that your dog will maintain your ideal weight, at the time that favor their longevity, whatever energy wear.